Dizziness is characterized as a feeling of lightheadedness or imbalance, and it can often result in fainting. It is a common complaint and often happens for a number of different reasons, including ambient temperature, diet, hormone imbalance, or medical conditions. Fortunately, there are various ways of preventing dizziness, and by knowing which habits are the triggers, it is possible to avoid these and thereby reduce the instances of the problem. 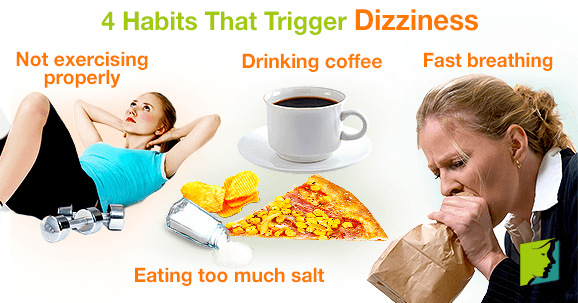 Keep reading to find out more about which habits trigger dizziness. Excessive salt consumption can result in dehydration, as the body needs to use more water in order to process it. As dehydration is one of the leading causes of dizziness, then it stands to reason that a diet high in salt will increase instances of dizzy spells. Salt can often be hidden in foods that are surprising, and is especially prevalent in processed food and ready meals, such as TV dinners. In order to reduce dizziness, it is recommended to read food labels and avoid adding salt to cooking. Caffeine has a dehydrating effect on the body, so the results are often similar to those of a high salt diet. Therefore, it is often advised that sufferers of dizziness cut down on the amount of coffee consumed or avoid it completely. There are plenty of other options to give you the energy you need, such as fruit, nuts, or whole grains. Exercise is important for overall health and it should by no means be avoided, but it is important to do it properly. This means making time for a warm-up and cool-down routine and avoiding getting overheated. During exercise, the blood vessels dilate to accommodate the increased blood flow, so stopping too abruptly means that the blood vessels are still large but the amount of blood flow has decreased. This can lead to a drop in blood pressure, and dizziness can ensue. To avoid this situation, drink cold water at regular intervals and take short breaks whenever you feel you need them. Hyperventilation might occur because of fear, stress, or even excitement, but it can cause dizziness, especially if you are particularly prone to attacks. The lack of balance between carbon dioxide and oxygen levels can affect your sense of balance and throw off the body's natural equilibrium. In addition, when you breathe too fast, your blood pressure may drop, and this can also trigger dizziness. Dizziness is unpleasant and can have adverse effects on everyday life. However, it is often the case that daily habits and lifestyle choices are triggering or worsening the problem. By identifying what you might be doing to trigger it, you are in a better position to manage dizziness. Menopausal dizziness is a frustrating ordeal, and certain habits can worsen it. Learn more here.